Medicine ball training is one of the oldest forms of strength and conditioning training – the first reference to wrestlers training with sand filled bladders appears in Persia nearly 3000 years ago. In ancient Greece the physician Hippocrates had them sewn out of animal skins and stuffed with sand. His patients threw them back and forth for injury prevention and rehabilitation. Their association with physical therapy gave them their name. Since that time technology has allowed us to expand this important concept in power training. AOK has been manufacturing medicine balls for the past 14 years using the same technological innovations that we developed for the manufacture of mediBall PRO. Modern balls are way ahead of the old leather ones. Medicine balls fill a void that traditional weights can’t because they allow you to successfully train using dynamic and random movements. Today’s medicine balls also bounce – remember you can’t safely bounce, catch or toss dumbbells. Rather than filling a bladder we have thickened the skin of our balls and weighted the plastic to achieve the desired training weight. Our rotary moulding method of ball production lets us include an inflation valve in the ball. This allows the user to change the skin tension by adjusting the amount air in the ball. This allows the balls to rebound and provide a very dynamic training environment. And much safer than throwing dumb-bells around the gym. In today’s competitive sports environment, strength and power have become extremely important for high level performance. But what is power. Power is the rate of doing work; that is, it takes into account the time required to do a given amount of work. The definition of work is force times distance, hence, power is composed of three components: (1) Force; (2) Distance; and (3) Time. Incorporating medicine ball drills into a training program is an excellent method for increasing both general and specific power. Specific medicine ball drills are those drills which simulate the movement pattern used by the athlete during a particular skill. General medicine ball drills are those drills which stress posture, balance, flexibility, and stability, but may not stimulate the movement patterns used by the athlete. These general medicine ball drills develop strength and power throughout the torso, laying the foundation for the future use of specific medicine ball drills. 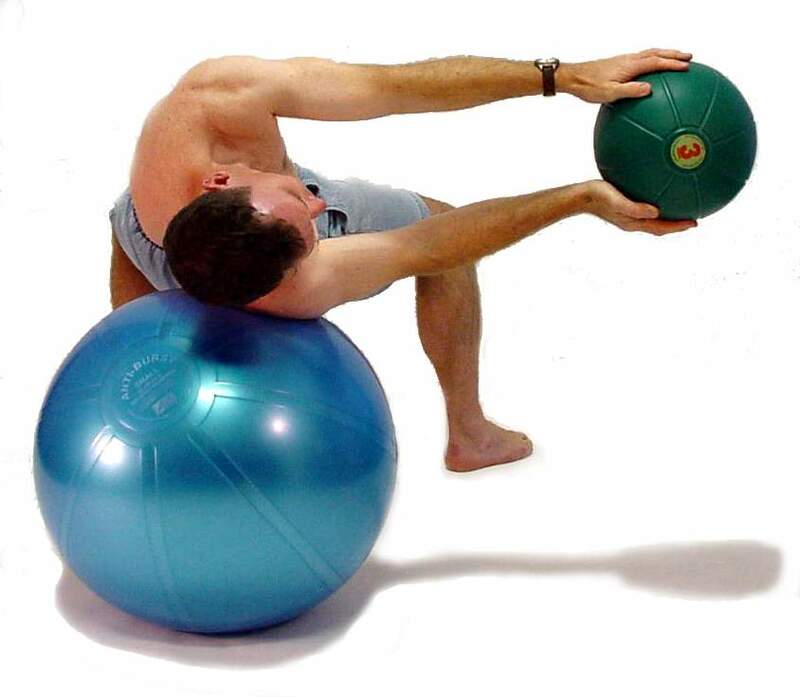 Drills with medicine balls such as those shown in Paul Chek’s DVD series “Dynamic Medicine Ball Training & Workout” will allow the athlete to work on many components of athletic ability simultaneously. These drills can be modified to follow the Principal of Specificity of Training (optimal carryover will occur when you overload the muscles in the exact pattern of movement). Since the drills require movement along various planes, agility, speed and power systems are challenged. Paul Chek says that medicine ball training provides a much-needed stimulus for the high threshold motor units and wakes up those fast twitch muscle fibers as part of pre-event training. In addition, the usual type of trunk training is done in the sagittal plane only. However, sport happens in three planes. Rotational training is one of the most neglected areas in many programs. Most traditional ab training is often done while lying down. Training for sport needs to take place in both prone and standing positions, with the emphasis on standing. These medicine ball exercises will add a new dimension to your training program in addition to improving your rotational power. Medicine ball exercises tend to be more ballistic than most traditional gym exercises and therefore should be performed with caution and only by advanced trainees. Make sure you are thoroughly warmed up before attempting these exercises. I recommend performing at least 2 sets of each exercise at 60% intensity prior to your work sets.